Keith Davison lost his wife Evy to cancer after a marriage of 66 years. He admitted that he cried a lot. And the peace and quiet eventually became too overbearing. So get this: The 94-year-old installed an in-ground pool in his backyard. With a diving board. And invited the neighborhood kids to jump in. Now his home is bustling with activity as his newly adopted “grandkids” bring life and laughter into it. He admits it didn’t make economic sense to install the pool. But who can put a price tag on joy? If you’re reading this, I don’t care if you are 24 or 44 or 74, you may consider yourself to be too old to enjoy, do, or attempt certain things. At least that’s what Adultitis wants you to believe. I love stories like this, because they call out Adultitis’ lies, its ridiculous rules that don’t exist, and remind me of what’s possible. The truth is, you’re never too old to play with Lego bricks, learn how to play the cello, or add a pool to your property. There were probably many “reasons” Mr. Davison shouldn’t have installed the pool, but now that he did, none of them matter. His actions called out Adultitis and they’re calling out you. Now that you’ve heard about this bold Adultitis Fighter, what does this make possible for you? Fun is a healer. Fun is timeless. 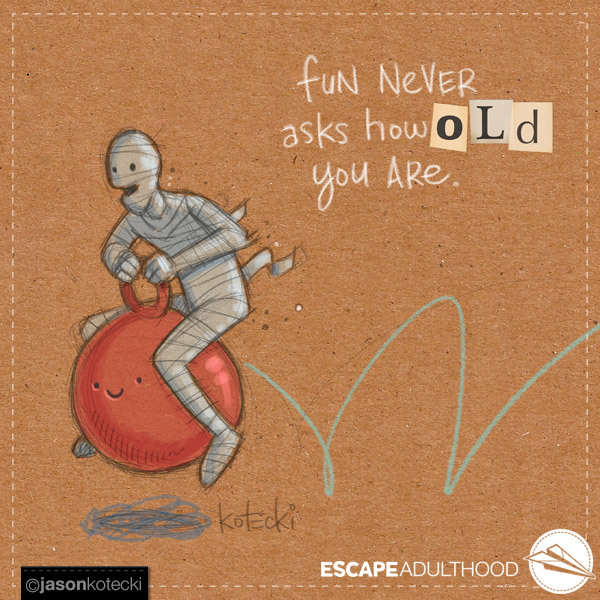 Fun never asks how old you are.